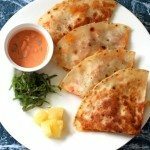 Korean fusion dish – Spicy chicken quesadilla recipe! It’s served with highly addictive gochujang salsa sauce! I love combining ingredients to give me more variety of food choices and be pleasantly surprised at its potential. Are you like me? It was Cinco de Mayo a few days ago (I actually didn’t know until that day what the celebration was for. I’m very new to Mexican history.) and I saw a massive influx of Mexican food photos on pinterest. I’m not sure whether I was influenced by that or not, but I’ve been wanting to use my favourite Korean food “Dak Galbi” (Korean spicy chicken) with some other ingredients to create a Korean fusion food for a while. 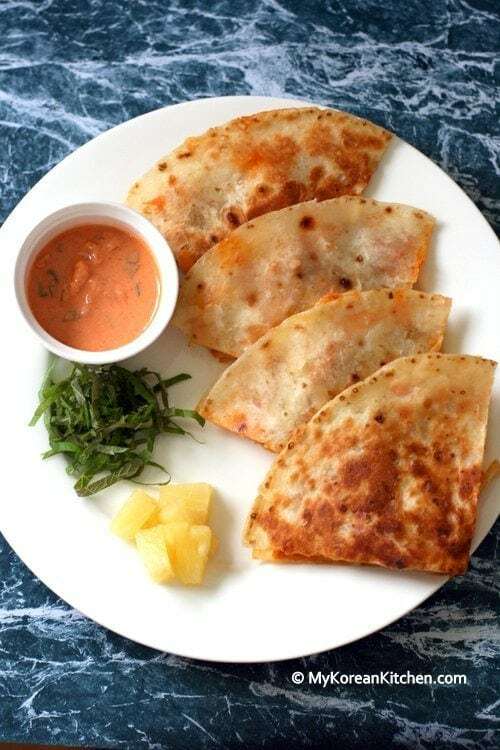 So here, I come up with Dak Galbi Quesadilla (Korean spicy chicken quesadilla, 닭갈비 퀘사딜라) with Gochujang salsa sauce. 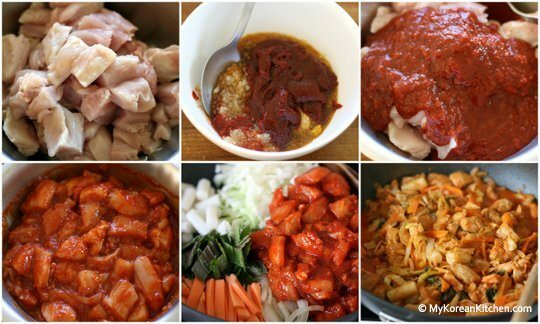 If you already know how to make Dak Galbi, combining the rest of the ingredients is relatively easy. I say “relatively” because I found it was a bit tricky to turn the stacked tortilla over safely without the filling falling out too much. 🙂 If you have your own secret way of easily turning the quesadilla over, please do share with us! I would love to know! To my surprise, Dak Galbi Quesadilla was a great success! All of my family thoroughly enjoyed it! You can strongly taste the full Dak Galbi flavour through melted mozzarella cheese and oil fried tortilla. I particularly liked when I could still feel the texture and the well seasoned taste of cabbage and perilla. That’s the best part of Dak Galbi, right? I hope you also enjoy this recipe. 16 Korean rice cakes – If you are using pre packaged ones, soak them in warm water for 5-10 minutes before you use them. 2. Put the chicken into a bowl, add the marinade sauce and mix well. Leave it for 30 mins. 3. While you are waiting, prepare other ingredients. -Clean all the vegetables. (Peel the skin if necessary – onion and sweet potato). -Thin slice (0.5 to 1cm thickness) the cabbage, sweet potato, onion and perilla leaves. 4. Pre-heat the wok on high heat and add some vegetable oil. 5. Put all the vegetables, rice cakes and the meat in the wok. 6. Stir them well while it is cooking. Once 5 mins has lapsed, reduce the heat to medium. 7. Continue to stir every now and then until all ingredients are cooked. Turn the heat off. 8. Place the frying pan on a stove and add some vegetable oil. Heat the pan on high heat for about 20 seconds. 9. 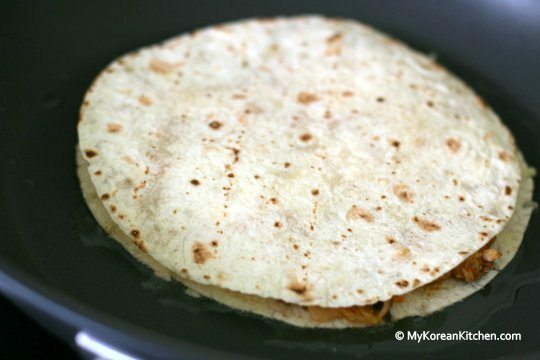 Put the tortilla wrap in the pan and add the Dak galbi (from step 7) and cheese and another layer of tortilla. 11. Turn the stacked tortilla over carefully and press it down with a spatula for 1 mins or the cheese is completely melted. 12. Repeat the step 9 to 11 until you use up the rest of the ingredients. 13. Cut the quesadilla into wedges and serve it on a plate. 16 pieces Korean rice cakes , if you are using pre packaged ones, soak them in warm water for 5-10 minutes before you use them. Put the chicken into a bowl, add the marinade sauce and mix well. Leave it for 30 mins. While you are waiting, prepare other ingredients. Pre-heat the wok on high heat and add some vegetable oil. Put all the vegetables, rice cakes and the meat in the wok. Stir them well while it is cooking. Once 5 mins has lapsed, reduce the heat to medium. Continue to stir every now and then until all ingredients are cooked. Turn the heat off. Place the frying pan on a stove and add some vegetable oil. Heat the pan on high heat for about 20 seconds. Put the tortilla wrap in the pan and add the Dak galbi (from step 7) and cheese and another layer of tortilla. Turn the stacked tortilla over carefully and press it down with a spatula for 1 mins or the cheese is completely melted. Repeat the step 9 to 11 until you use up the rest of the ingredients. Cut the quesadilla into wedges and serve it on a plate. Enjoy! I made this today! So good! I’m glad to hear you and your family enjoyed my recipe! For your future reference, my bulgogi recipe is here. 😉 https://mykoreankitchen.com/bulgogi-korean-bbq-beef/ My 2 years old also loves Bulgogi. It’s definitely popular food among kiddos! I have two quesadilla tricks. One option is, when cooking the quesadillas in a pan, to flip them outside of the pan. What I do is keep two plates at hand. I move the quesadilla sideways out of the pan and onto a plate, put the other plate upside down on top, and flip the plates with the quesadilla safely inside, then move the quesadilla sideways back into the pan. Thanks for the tip Amy! I can’t believe you are using an iron for cooking! I’ve never heard of such thing but it sounds very effective! 🙂 Impressed! Oh My Word! I adore Korean cuisine and fusing it with a quesadilla?! Drooling! Can no WAIT to try this…as in tomorrow Ü I love making quesadillas and my tricks are two use two tortillas per quesadilla and butter only one side of each tortilla. Put the butter side down in the pan and immediately add cheese to form the “glue”. Add other ingredients and always ends with cheese touching the tortillas to keep it all together. You can also portion out the cheese to include some in the middle to adhere ingredients. The butter helps to form that crispy outer texture without it being greasy. Thanks for a fantastic recipe! What a great fusion recipe! I would love to try these. I make quesadillas by folding the tortilla in half, and using enough cheese around the open edges to keep the filling from falling out. Otherwise, as you can tell, flipping them over can get very messy! Very creative. Love the fusion! 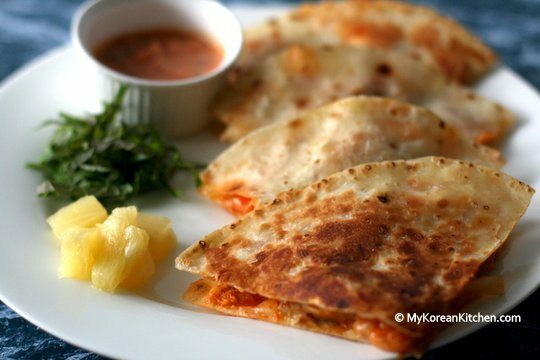 I wanted to celebrate Cinco de Mayo with your Korean quesadilla! YUM!! Gochujan salsa sauce… brilliant name. This is a great snack and appetizer! Wow, now that’s a unique quesadilla! I love spicy food so I know I’ll love this. Great post! Thanks Anne for stopping by and for your comment. Great looking dish! And the flavors sound wonderful. I love the idea of combining Korean and Mexican – the two pair quite well. Good stuff – thanks. It looks like an extremely creative and delicious fusion dish! I’m sure I would love it too. I rarely cook Mexican (and frankly don’t know it well) but your Korean filling sounds even better than any Mexican tortilla filling I have ever seen. Thank you for the inspiration! I don’t know Mexican food well either but experimenting is always fun! And THANK YOU! Korean-Mexican fusion is big here in the U.S. I’m a huge fan myself. This looks delicious. I can see why it was such a hit with your family. 😀 I usually use a lot of sticky ingredients (like cheese, or refried/mashed beans) to prevent the ingredients from falling out, if that helps. Maybe it’s just an excuse to get more of my favorite ingredients in there! Hope you are enjoying your weekend! Thanks for the tips! Hehe love your excuse. Congrats on the success of your experiment. I’m of the opinion that anything stuffed into tortillas and cheese would be good. Glad I haven’t been proven wrong yet. I love tweaking and fusing ingredients too. This is a wonderful fusion. Definitely Korean meets Mexican cuisine. YUMZA! Thanks Malou! I bet you love tweaking and fusing ingredients with your multicultural background! You have a great weekend too.